Would Iran reformers gain upper hand with UNSC Nuclear Deal? For Iranian President Hassan Rohani, a nuclear deal with global powers would be a double-edged sword. An agreement to restrict Iran’s nuclear program in exchange for sanctions relief would bolster Rohani’s reputation among Iranians who want better ties with the world and allow him to claim credit for the removal of painful economic punishments, potentially increasing his leverage with hard-line conservatives in the ruling establishment. But it would also expose the self-proclaimed moderate to increased pressure from the hard-liners,who have been resisting attempts to loosen up the atmosphere within Iran and give its people more freedom. A deal would provide Rohani with “a lot of political capital,” said Alireza Nader, an Iran analyst at the Rand Corporation, a U.S.-based think tank. But Nader said that hard-line conservatives who control key institutions in the tightly controlled theocracy would be likely to strike back. Rohani has so far had the backing of Supreme Leader Ayatollah Ali Khamenei, who has the final say in all state affairs in the Islamic republic. But observers believe that Khamenei‘s support for Rohani will last only as long as the Iranian leader feels that his own authority is not being challenged. “The supreme leader will never allow Rohani to gain too much influence,” said a Tehran-based political analyst who did not want to be named, adding that Khamenei has already indirectly criticized the president’s social policies. Iran and six global powers are negotiating a deal that would end a 12-year standoff by placing restrictions on Iran’s nuclear activities, which Western governments fear are aimed at developing nuclear weapons capability in exchange for relief from UN and Western economic sanctions. Iran claims the program is purely peaceful. EU foreign policy chief Federica Mogherini said on July 7 that talks in Vienna between Iran and six world powers — the United States, Britain, France, Germany, Russia, and China — would continue for “several days,” confirming they would go on beyond a deadline that had already been extended from June 30. If a deal is reached, Rohani may face more pressure from both sides of Iran’s divide, with liberal and moderate supporters hoping he will shift focus from the nuclear standoff to domestic issues. “Many have remained silent in order not to hurt Rohani while the country is negotiating a nuclear deal. But once there is a deal, people would want to see action on the economy and other issues, the analyst in Tehran told RFE/RL. 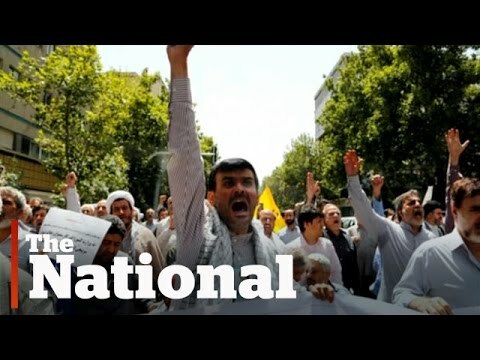 Many Iranians desire better relations with the world, and a more open society at home. But hard-line conservatives are against any kind of opening up that could jeopardize their grip on power. A deal could prompt them to tighten the screws at home, in order to maintain control and avoid the impression that Iran has given in to pressure from the United States — demonized as “the Great Satan” by some in the ruling establishment — and the European Union. And while a nuclear deal would bolster Rohani, domestic opponents could use it as a weapon against him by suggesting he failed to stand up to the West. In recent months, hard-line conservatives have opposed attempts by Rohani’s government to ease restrictions and open up the social and cultural atmosphere in Iran. They have prevented a number of concerts and cultural events throughout the country from taking place, and have successfully opposed an attempt by the government to allow women to attend some male sporting events. They have also been highly critical of Rohani’s comments in favor of lessening the state’s interference in Iranians’ lives. Some Iranians interviewed by RFE/RL said that while they hope a nuclear deal and the removal of sanctions will improve the economy and make life more affordable, they don’t expect to see major social changes. “Some have very high expectations, they think a deal will transform the country. I don’t think so, as long as these mullahs are in power, things will remain the same,” a 65-year-old woman in Tehran said on condition of anonymity. A 19-year-old student, also in Tehran, was more optimistic that a deal would open up the country. “Whether the extremists like it or not, it will happen,” he said. The student believes a nuclear agreement that would lead to economic improvements, increase foreign investment, and lead to more job opportunities would be a big a big morale booster for young people in Iran, giving them hope for a better future. “Currently I and many people my age feel that there is no future for us in this country,” he said.